The owner of 18 central Iowa Medicap Pharmacies is announcing plans to formalize the chain’s policy not to sell tobacco products, a move that’s winning praise from the Iowa Tobacco Prevention Alliance. That’s a state-wide group of health professionals and concerned citizens. Alliance board member Micki Sandquist, executive director of the American Lung Association in Iowa, says she hopes Iowa’s largest grocery chain is next. Last fall, CVS, the nation’s second-largest pharmacy chain, stopped selling all cigarettes, cigars, chewing tobacco and related products. CVS has 18 stores in Iowa, while the biggest chain, Walgreens, has nearly 70. 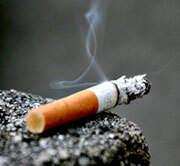 An estimated 4,400 Iowans die every year from tobacco products. Sandquist says putting policies in place like Medicap is doing can help to lower that number, as well as prevent young people from starting. Iowa Attorney General Tom Miller has said it sends a mixed message for a drug store to sell cigarettes. “A company that’s in the business of making people healthy should not be in the business of selling cigarettes to make them very unhealthy and die,” Miller says.